There are over 10,000 species of ants in the world, with about 700 species in United States. Only about 25 species commonly infest homes our region. For control Raven has simplified this complex batch of species together in groups that have similar behavior and can be controlled with minor variations in the same way. The first group is carpenter ants. This species are the most worrisome of all. Carpenter ants are a wood destroying species that forage over large areas, sometimes alone and navigate by using the sun and other obstacles. These species of ant nest in the ground, hollow trees, or cavities, wall voids of a structure. Unlike termites, carpenter excavate wood. The second group of soil ants, pavement ants, odorous house ant are wood destroying. These species regularly invade living quarters mostly along distinct scent trails, in search of food, water shelter. They live in clearly defined, shallow ground nests or in cracks, and cavities in the structure of the house and require service per these behaviors. The third group of ants we classify contain odd species like the pharaoh ant, Argentine ant. These species aren’t very common and require special attention and a specific type of treatment different from the more common species of ants. Ants have replaced roaches as the #1 pest in the United States. Peoples main objective to ants are that they invade living quarters looking for food and water, and thus get into food for pets, children and adults. Ants are seen crawling around in the kitchen sink, shower stalls, bathrooms in search of water. Small particles of food crumbs left on kitchen counter tops, floors, pet bowls, even dead insects provide enough food to thrive. 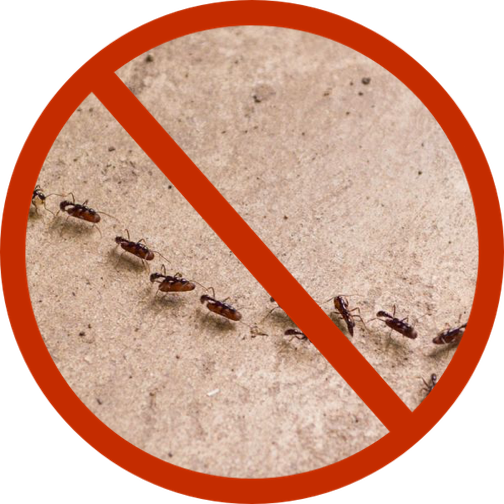 The treatment of ants is largely dependent upon the species of ants found during our inspection. Ideally, you’ll want to locate the nest and eliminate it. Sometimes achieving that can be difficult. At Raven we can design a program to help solve ant problem at your home, or business. Get in touch with Raven Termite and Pest Control to have a state licensed technician provide you with a free pest inspection of your home or business.